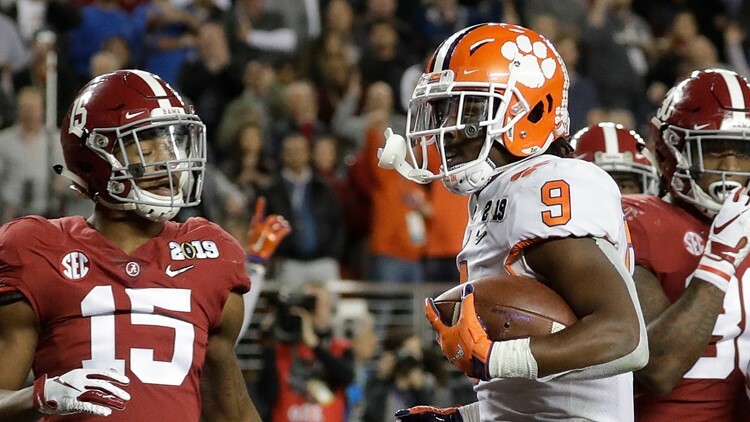 Clemson rising junior Travis Etienne will receive the Blanchard-Rogers Trophy at the South Carolina Football Hall of Fame enshrinement ceremonies later this month in Greenville. This past fall, the sophomore had a record-breaking season that saw him rush for a school-record 1,658 yards on 204 carries with a school-record 24 rushing touchdowns. He also added two receiving touchdowns, tying the ACC record for total touchdowns in a season with 26. Etienne was named ACC Player of the Year, ACC Offensive Player of the Year, and first team All-ACC honors. Nationally he was a Doak Walker Award Finalist, Maxwell Award Semifinalist, and named to numerous first and second All-American teams as the Tigers won the program's third national championship. The Blanchard-Rogers Trophy is named for two Heisman Trophy winners with ties to the Palmetto State. Felix “Doc” Blanchard was the first football player with South Carolina ties to win the Heisman Trophy. He was born in McColl and went on to win the award in 1945 while playing for Army. George Rogers, who was born in Georgia, won the Heisman in 1980 while playing for the University of South Carolina. Etienne finished seventh in the voting for the 2018 Heisman Trophy.